Tony is the creator and band leader of PURE McCartney - a musical celebration featuring McCartney classics from The Beatles until today. 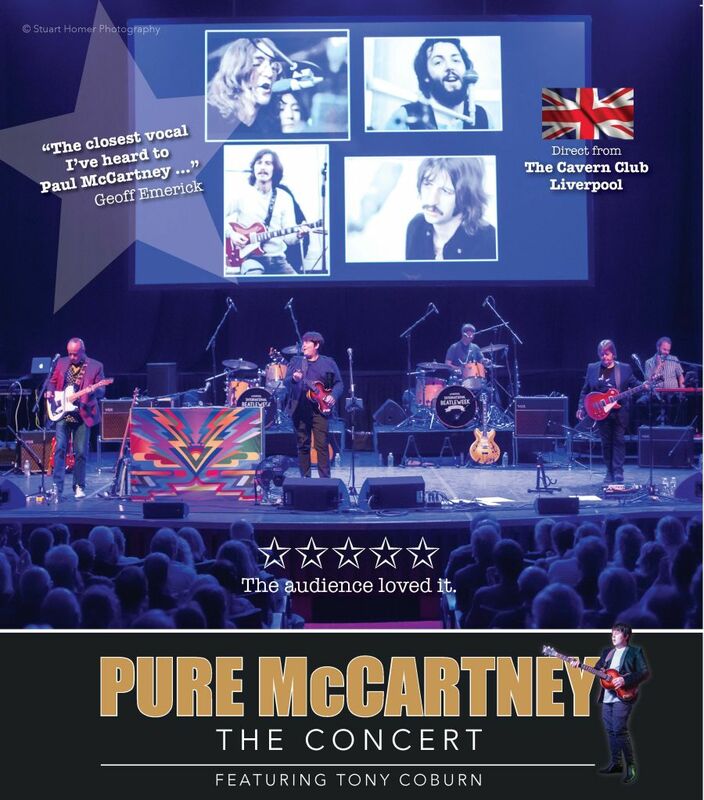 PURE McCartney features six talented musicians who all share a love of Paul McCartney's songs and faithfully recreate the sound and atmosphere of being at a McCartney show. Tony Coburn grew up in Liverpool, listening to The Beatles and spending his free time playing his guitar. As a teenager he formed the Blue Meanies, and began gigging all over Liverpool playing Beatle songs. Tony soon became known for belting out songs just like a young Paul McCartney. The Blue Meanies toured throughout the UK, Europe and USSR. They are the only Beatle tribute band to have ever performed on the same bill as Sir Paul McCartney - at a tribute concert for George Harrison in Liverpool in 2001. In 2013, Tony made his Broadway debut playing the part of Paul McCartney in Let it Be at the St. James Theatre in New York City. In 2016, after a world wide search, Tony was personally chosen by Beatles recording engineer Geoff Emerick to play the part of McCartney in The Sessions which toured the UK and Europe. Emerick said Tony was the closest vocal match to Paul McCartney that he had heard. Hollywood Reporter: ‘We were convinced it was Paul McCartney on stage at The Royal Albert Hall'. Tony currently performs sell-out shows at The Cavern Club in Liverpool, as part of the Cavern Club Beatles. PURE McCartney is must see for any McCartney and Beatles fan. Book in advance.